New Year’s Eve, just an excuse to party? To me New Year’s Eve ranks right up there with Valentine’s Day. The latter is a ‘created’ holiday to make sure every year you tell your sweetie how much you love them – shouldn’t you be doing that every day? If you don’t already, start. I don’t need a holiday to remind me to do such things. Sure, like anyone else, we could have a few more romantic nights throughout the year, but busy life and kids get in the way sometimes. I’m okay with that though. It’s a stage in life we’ll never get back. New Year’s Eve is just an excuse to party. It’s a ‘holiday’ that brings out the craziest people and leads to thousands of DUI arrests and even deaths. Maybe that’s a little extreme, but it is true. I have no desire to leave my small town of Sonoma and drive to San Francisco (or anywhere else) where there are countless parties happening and have to drive back at two in the morning when I’m fighting sleep. And it’s not just that I’m getting older and no longer in my 20’s (or early 30’s for that matter). I’ve always been this way. I remember the first year my parents said I could stay up until midnight – I fell asleep in front of the TV and missed it. Most years that is still the case. 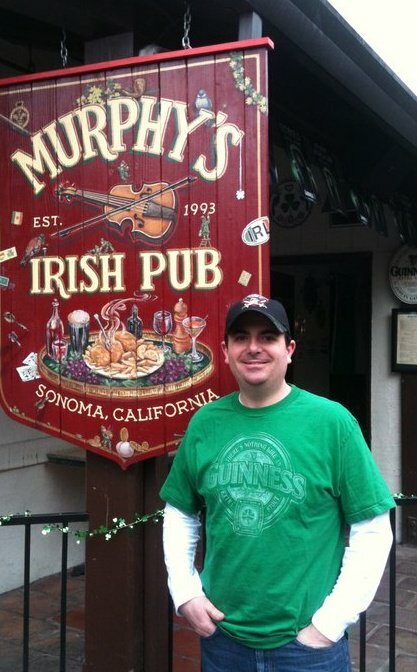 A couple of years ago, we decided to start celebrating the Irish New Year at Sonoma’s local pub, Murphy’s…. Ireland is 8 hours ahead of us, so that New Year happens at 4:00 in the afternoon here. Perfect. Walk to the pub, have a pint and a shot (maybe some food) and walk home before most people are even getting ready to go out. I highly recommend it. The holiday we’re celebrating tonight is a new year. Of course, that new year will bring all the good things you have been expecting for the past __ (fill in the blank) new years’, right? Next year is the year you’ll lose that extra 10 lbs. It’s the year you’ll quit your job and start doing what you love. The year where all your dreams will come true. Really? Is it true? Will those things happen to you? I hope so. But in reality they only happen if you make them happen and why didn’t they happen this past year? I’m not being cynical, I’m a dreamer like many of you out there. I’ve never been one for New Year’s Resolutions though. It’s setting yourself up for failure. How many people want to start losing weight when they are fighting a nasty hangover? Seriously. I’m realistic about the goals I set for myself. I need to lose those extra 10 lbs too…and I hope that tomorrow morning I get up and workout or maybe go for a bike ride since it’s going to be a nice day. But I realize that it will take time and sometimes I have very little of that. So at some point can’t we just be happy? Can’t we enjoy the life we have? And next year look back and think, “that was one of the happiest years of my life”.